Who is Robert Valley ? Robert Valley was born In Vancouver in 1969. 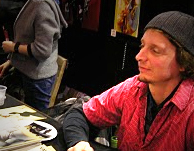 After completing a 4 year animation course in Vancouver, Robert moved to San Francisco in 1992. Robert began directing animated commercials. In 1997 he opened up his own company called Maverix studios, also located in San Francisco. In 2000 he went back to being freelance on the roads, working in UK, France, Spain, New Zealand, Korea, etc. He now lives in the US. He is most famous for his work with the band Gorillaz. Robert Valley used a pencil to draw a splendid 2 pages perspective of a party. You can stay one hour watching this drawing and still not understand how it's done !